Halifax Vandals were crowned Yorkshire Three champions when they eased to a 19-3 victory away to a robust and dogged Castleford side determined to spoil the party. 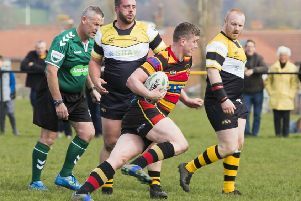 Although the Warley men fell one try short of a bonus point victory, which would have maintained their one point lead over Goole at the top, they took the title after registering two more wins than their rivals. The full time whistle was greeted with euphoric scenes on a bright and sunny day as spectators and players celebrated together on the field. Vandals’ success was totally unexpected by many within the Yorkshire rugby fraternity. Written off after winning two of their opening six games and being unceremoniously dumped out of the Yorkshire Trophy by bottom of the table Stocksbridge, the turnaround has been incredible. In truth the game was a little bit of an anti-climax with Vandals never hitting previous heights and only turning round with a 5-0 lead. The Vandals scrummage was dominant throughout and the visitors bossed the first 30 minutes without reward, frustration growing as penalties were missed and opportunities squandered. Eventually Vandals forced a five metre scrum after a good kick from Gallagher. They were held just short on several occasions before live wire Sutcliffe picked up at pace to drive through in the corner. Vandals’ defence was resolute at the start of the second half but home captain Thomas Egan, a constant threat, opened the Castleford account with a well struck penalty to narrow the gap to two points. Vandals exerted extensive pressure through Hamer, Mitchell and Sutcliffe. Castleford second row Jonty Aveyard was yellow carded for a high tackle and Vandals immediately made the extra man tell. A terrific pass from Gallagher enabled Binns to crash through the home defence. As he looked to off load for a certain try, Bryson was tackled without the ball and a penalty try was awarded, converted by Jimmy Crowther. Binns then hit a superb angle to crash over for a converted try next to the posts but the game lost some of its direction after Sutcliffe was yellow carded and meandered to a rather aimless conclusion. Vandals can reflect on four strands that have driven them forward. Teamwork on the field and throughout the club has led to a spirit which has been evident every weekend; discipline has improved markedly; fitness has told in the late stages of several matches; and the forwards have maintained their extraordinary power and pressure for the full 80 minutes. Leadership has also played its part. Player/coach Jamie Bloem must take credit for simplifying the game plan after the 45-19 defeat at Knottingley and Paul Jowett has been an exceptional captain. Jowett was an emotional but proud skipper after Saturday’s game.